April’s pick was Mr Selden’s Map of China, by Timothy Brook. I assume you’ve read it; if you need a summary of the contents see here. I happened to be reading this in Singapore, deep within nanyang, but wherever you read it, I expect you couldn’t do so without pondering the ongoing squabbles about how the map should be drawn today – squabbles which Brook of course discusses. Hence it was interesting to learn the Selden Map was not in fact drawn to support territorial claims and can now be of no use in arguments about who owns which uninhabited patch of rock jutting from the sea, or which air force can fly where, but was purely a navigational chart enabling early seventeenth century pilots of merchant vessels to navigate from A to B.
I also found it interesting that nobody in England seems to have learned anything much from the Selden Map in the years immediately after it arrived there – partly because nobody in the country could read Chinese. What kinds of context can we use to understand the Selden Map today? Brook seems to see it through a lens looking forward from its own time to colonialism, or backwards to it from ours, but with the map’s emphasis on trade, and indifference to territorial claims, it could equally well foreshadow today's more equal trade patterns in South East Asia. I found the passages on the early Europeans' encounters with Chinese fixers hilarious, and saw in these encounters examples of the clever, canny Chinese ripping off the whites – yes the canny Chinaman is a cliché, but why is a cliché a cliché? Brook, however, probably a nicer person than me, refused to be so uncharitable, generously absolving the Chinese of taking the ang mo for a ride. In Singapore, ang mo, or ang moh, is the current slang term, and these are the current Romanised spellings, for a European – like gweilo / gaijin / bule / farang / mat salleh in other places. Until I read this book I thought it was a nineteenth century term, but it seems it dates right back to when Chinese people first encountered Westerners, and were shocked by their red (ang / hung / hong) hair (mo / moh / mao). The chapter which contains this information, Reading Chinese in Oxford, I found one of the most interesting in the book. It set me to wondering: can Mr Selden’s Map of China be read in Chinese in Beijing? Is there a Chinese translation available? I haven’t been able to track one down – but then, I don’t know how to render Mr Selden or Timothy Brook into Chinese, so doing an internet search was difficult. But if there isn’t a Chinese translation, I think Timothy Brook (ti mu xi bu lu ke?) should provide one forthwith – maybe adding a chapter Reading English in Renmin? But enough of what I thought. What did others think? Jen from Hong Kong was not wildly enthusiastic. The history is interesting, but I find cartography less than grabbing, so I found myself skipping, especially in the chapters on the compass, and on the idea that earth is square. I suppose it is undeniable that if you don’t like maps, then this is not a book for you, but considering he was writing about a map, I thought Timothy Brook kept his book remarkably free of technical discussion of cartography. I didn’t find the cartography overwhelming, although I didn’t always completely follow it - I don’t think Brook can be held responsible for that, I’m just too dim to grasp how a sphere is drawn on a flat piece of paper. I enjoyed Brook’s clear, precise and yet inviting style - I thought his use of the first person worked well. Brian also from Hong Kong also had quibbles, although not about the book, about the format he chose to read it in. I read the book on a kindle, and I found it very badly organised. I couldn’t find the map, or see it very well. The map should have been more prominent, and should have been reproduced more clearly. I too read this book as an eBook, and I too would have found flipping to the map, and to the other illustrations, easier in a printed book, but I think this is more of an issue for the people who design eBooks, than for a book club? Korean-American Lee’s oeuvre is largely made up of novels about Asians assimilating into American society and in some ways this one is no different. Fan, a young woman of Chinese descent, leaves her native Baltimore to find her disappeared lover, Reg. However, the near-future America she travels through is going off the rails, enabling Lee to ponder how crisis stratifies society and collapses morality. Lithe and tiny, Fan is a diver at the New China settlement of B-Mor, a worker colony long-ago known as Baltimore, her circumscribed world the temperature-controlled fish tanks that feed a contaminated continent, and Reg, the golden-skinned, simple-hearted man she loves. Rigorously pressurised and demarcated, the America that Fan serves is ruled by the professional Charter caste. While B-Mors are obedient and tranquillised by duty and the fear of chaos, the pampered, ruthless Charters inhabit idyllic, over-supplied communities behind whose gates they jostle ceaselessly for dominance. Estranged from nature, B-Mors and Charters alike shy from the spaces between, where outcasts, free-thinkers and renegades, bandits and pedlars forage and grub and steal and kill. One quiet day Reg is removed from the colony - whether for a nameless infraction, or because he is disease-resistant in a world where no one is C-free, it is impossible to say. Fan decides she must follow. But her departure threatens to disrupt the whole order of B-Mor society, and only savage action can hold it together. On Such A Full Sea is published by Little, Brown, in paperback and eBook formats, priced in local currencies. Both Mr Selden’s Map of China and On Such A Full Sea are eligible for the ABB book of the Lunar Year in the Year of the Horse. See the post of Jan 30 2014 for details. If you would like to vote for either title please do so by posting a comment, or contacting asianbooksblog@gmail.com. Decoded tells the story of Rong Jinzhwen, one of the greatest code-breakers in the world. A semi-autistic mathematical genius, Jinzhen is recruited to the cryptography department of China's secret services, Unit 701, where he is assigned the task of breaking the elusive 'Code Purple'. Jinzhen rises through the ranks to become China's greatest and most celebrated code-breaker; until he makes a mistake. Then begins his descent through the unfathomable darkness of the world of cryptology into madness. Decoded was an immediate success when it was published in 2002 in China. With the pacing of a literary crime thriller, the novel combines elements of historical fiction and state espionage. Taking place in the shadowy world of Chinese secret security, where Mai Jia worked for decades, it introduces us to a place that is unfamiliar, intriguing and authentic. And with Rong Jinzhen, it introduces us to a character who is deeply flawed and fragile, yet possessing exceptional intelligence. 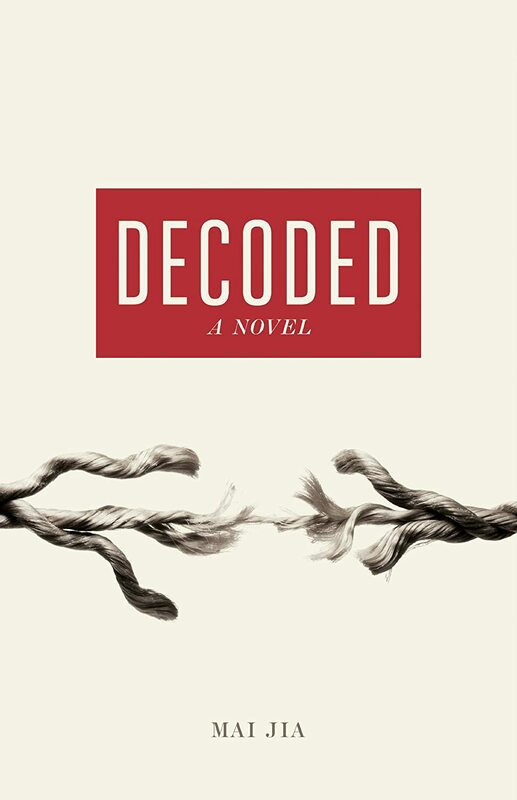 Decoded is an unforgettable and gripping story of genius, brilliance, insanity and human frailty. Mai Jia (the pseudonym of Jiang Benhu) is arguably the most successful writer in China today, with total sales of over three million copies of his books. He became the highest paid author in China last year with his new book, Wind Talk. He has achieved unprecedented success with film adaptation: all of his novels have been made into films or TV series, the screenplays of which are often written by Mai Jia himself. He has created a genre that combines spy craft, code-breaking, crime, human drama, and historical fiction. He has won almost every major award in China, including the highest literary honour - the Mao Dun Award.